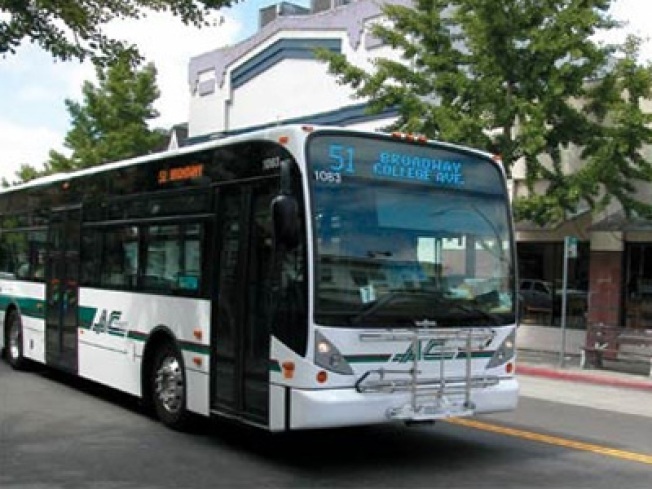 A judge today reaffirmed his order that AC Transit must engage in binding arbitration for a new labor agreement for its 1,750 employees, including 1,200 bus drivers. Lawyers for AC Transit, which serves parts of Alameda and Contra Costa counties, asked Alameda County Superior Court Judge Frank Roesch to reconsider his July 16 order that the bus agency use a third party to help reach a new agreement on a contract between the agency and the Amalgamated Transit Union Local 192. Bus drivers began calling in sick at more than twice the normal rate after management imposed a new contract on July 18. The sickout had a ripple effect, delaying commutes for as many as 200,000 passengers. AC Transit and the union have agreed on an arbitrator, but talks aren't scheduled to begin until Aug. 20. Roesch said he thinks talks should begin before then, saying "there's just no reason to put it off." He said that if he were the arbitrator, he would order the two sides to engage in marathon talks, including over weekends, so that a new agreement could be reached quickly.The delay in starting arbitration "is just irresponsible," Roesch said.